A great Fortress looms in the distance... and it must by yours! Accept the challenge against all others to conquer the Fortress! Fortress is a game about risk taking, out-witting and bluffing your friends to become the dominant ruler of the kingdom. The Fast Forward series uses the new Fabled Game system introduced in Fabled Fruit. With the presorted deck of cards you will discover all cards and rules as you play. 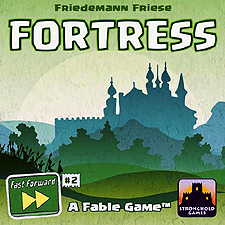 It will take 12 games of Fortress before your group has explored the entire system. It can then be reset and played again by the same or different groups!